This is a used grade D device which has been dropped. The LCD is still in perfect working condition. 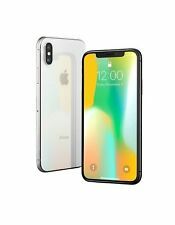 Apple iPhone X - 256GB - Space Grey (EE) A1901 (GSM). Condition is Used. A fantastic phone that served me well and is only going due to being replaced by the Xs model. 256gb which I have struggled to even fill half of, and a camera that really does replace the need for any other camera to carry out! Phone is in good condition except for the slight scratch running vertically up the back as shown in the photo - an unfortunate case caused this to happen! Otherwise condition is just some general scratches to the edges but nothing noticeable! Feel free to ask for any more photos or information! A fantastic buy!! EBAY PREMIUM SERVICE! OVER 40,000 CUSTOMERS SERVED! Apple iPhone X - 64GB - Space Grey Blocked On UK Network New In Box. Dispatched with Royal Mail 1st Class. The phone was bought at launch and is in great condition save for a couple light marks on the bottom. This device is used but in good working condition. Our Ref: LB991. Apple iPhone X 64GB Space Grey Smartphone (Unlocked) - Working. Phone is not locked to any Apple ID or iCloud account. Find my iPhone is not active. The screen has a few light scuffs but is still in very good condition overall with no scratches present. Apple iPhone X 256GB. After this incident I then bought a new case which protects the entire phone (I will include this with the phone/box/accessories etc), with the intention of replacing the screen. Apple iPhone X - 64GB - Silver (Unlocked) A1901 (GSM). Apple iPhone X - 64GB - Silver (Unlocked). FRONT AND BACK CRACKED. STILL ALL WORKS FINE INCLUDING FACE ID. iCloud REMOVED.PHONE AND ORIGINAL BOX ONLY. APPLE WARRANTY TILL 24TH JULY. 5 out of 5 stars - Apple iPhone X - 64GB - Silver (Unlocked) A1901 (GSM). 88 product ratings88 product ratings - Apple iPhone X - 64GB - Silver (Unlocked) A1901 (GSM). iPhone X 64gb on 02 6 months old Immaculate condition, always kept in a case. No box or charger. Harrier Mini from EE x2 : working, locked on ee. Nokia Lumia 800 : working, locked to EU network. Nokia Lumia 625 : working, locked to EU network. Nokia Lumia 1020 : working, locked on O2. Iphone 5c : working ,locked on unknown network. Apple iPhone X - 64GB - Space Grey (O2) Cosmetic Condition is Used. -Sold as seen in photos. Happy to send more if needed. Looks new with case on. Comes in original box. Works amazingly well, super quick and will be sent with screen protector. Screen is perfect, great for photography enthusiasts. All round great phone. Selling due to upgrade with new supplier. Dispatched with Royal Mail 1st Class. Great Condition with leather case. IPhone X Space Grey O2 (giffgaff) 64GB. iPhone X Space Grey O2. A11 Bionic. Four efficiency cores are up to 70 per cent faster than A10 Fusion. Plus, wireless charging for a wireless world. With no charging cable required, iPhone X is truly designed for the future of wireless. SMASHED BUT STILL IN FULL WORKING CONDITION! Ideal to profit from if you know how to fix them! Apple iPhone X - 64GB - Silver/white (Unlocked) A1901 (GSM). Condition is Used. Dispatched with Royal Mail 1st Class. 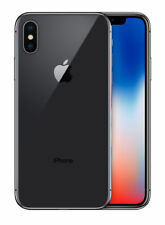 Apple iPhone X - 64GB - Space Grey (Unlocked) A1901 (GSM). Condition is Used. Front glass is broken and FACE ID doesn’t work. It comes with a charger and box. Dispatched with Royal Mail 1st Class. Condition is Used. Apple IPhone X unlocked 64gb space grey. Small crack in bottom left and top left hand corner. Exact product being sold is shown in pictures. 64GB Internal Storage. Factory Unlocked (for sim/cellular tablets). NEW APPLE IPHONE 7 Factory Unlocked 32GB. This product is Factory unlocked and sealed. If you wish to use the phone outside. In the event that your creditor(s) takes possession of your assets. Apple iPhone X - 64GB - Silver (Unlocked) A1901 (GSM). NoFace ID!!! Very good condition. No accessories, only box present!! Cash on Collection Only!!!! The phone cost £1249 when new and was factory unlocked so you can be sure it will work with all UK networks. Find my iPhone is disabled, it has been signed out of iCloud and iTunes and reset ready for its new user. The phone has been used for 10 months only with Apple warranty remaining. Still hasApple Warranty! All Original Paperwork. Original USB UK Wall Adapter. Original Box. Never had any issues, original screen. Very slight grazes about 1/3 down from top on screen from credit cards in wallet type cover which I can’t even show on photos and only visible if you look hard when the screen is off, not visible when screen is on. Apple iPhone X - 64GB - Space Grey (Unlocked) A1901. Condition is Used. Dispatched with Royal Mail 1st Class. The phone is unlocked to any network. Excellent condition, always had a screen protector and original Apple leather case on from new. Any inspection welcome prior to bidding. No offers please, I am not in need of a quick sale. I will post via Royal Mail 24 hour tracked and signed for. UK buyers only and PayPal payment only please. It protects the buyer and seller :) Any questions, give me a shout. IPhone X in Space Grey. For sale is an Apple iPhone X. -All the features work perfectly. The iphone will be reset back to factory settings and wiped clean of any personal information. Iphone X 256gb Silver/White currently on o2 network. Ive only ever had iPhones, the X is the best I’ve had yet! Everything works excellently and is in good overall condition. The latest and greatest in Apple’s line of smartphones , the iPhone X fuses highly functional features with a brand-new design never before seen on an iPhone. Announced in September 2017, alongside the iPhone 8 with a very similar performance, the iPhone X essentially encapsulates the same internal workings but within a brand new physical design. Available in either space grey or silver, the new iPhone X uses its predecessors as an influence, using familiar designs to create an all-new model. With the glass back of an iPhone 4 and the metal trim of the iPhone 6, this Apple smartphone is truly distinct in its own right. The 5.8 inch Super Retina HD display reaches to the very edge of this phone, the first edge-to-edge display in the iPhone’s history.The iPhone X features a dual 12 megapixel cameras - a wide-angle and a telephoto camera. Capture up to 4K video at either 24, 30 or 60 fps - great for capturing any memorable moments. Optical image stabilisation negates image blur and can help to keep videos steady. The front-facing TrueDepth 7 megapixel camera is capable of 1080p video recording, giving crystal clear visuals when facetiming.Wirelessly charge the iPhone X with a compatible charger. Simply place your device flat on its back on a charging pad and charge up to 50% in just 30 minutes! Face ID gives you access to your phone through facial recognition, adding an extra level of security to your device. FaceID learns any changes through time, e.g. should you get new glasses or grow a beard, then your phone will learn these changes! The TrueDepth front-camera can also analyse your facial expression and create a matching Animoji, great for joking around with friends.The A11 Bionic chip is the most powerful ever used in an iPhone and can carry out 600 billion operations per second, ensuring that you enjoy the speedy new processor. Enjoy up to 21 hours of talk time, 12 hours of internet use or 60 hours of audio playback. The new battery can also reach 50% of its charge capacity with just 3 minutes of charging.